NFL Team Logo Charm Ankle Bracelet! This adjustable anklet is cast in lead-free pewter and contains EXCEPTIONAL 3-D DETAIL. 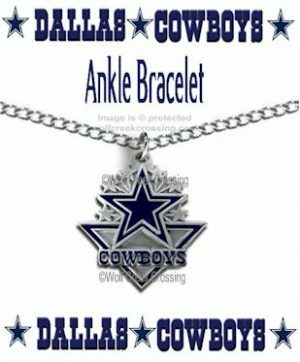 The anklet charm hangs from a silver chain that measures approximately 10″ in length. If the chain is too long, simply fasten the hook to a closer link or clip the chain to the length you prefer. ALL of our products come to you in NEW, UNUSED CONDITION. We will package your purchase with special care and send to you via USPS First Class mail.